A friend of mine in the United Kingdom wrote to me saying that she had recently run for office as a Conservative councillor. In her letter, she said that she was more "centre-Right" politically. The concepts of left and right in politics have always been somewhat of a mystery to me. There seems to be much confusion and little con­sistency in what is meant by Left and Right. Conservatives, like Thatcher and Reagan, are said to be on the right. They favour an exploitative socio-economy run on the basis of free-market capitalism. But Hitler and Mussolini were said to be even more to the right. And they are [national] Socialists. Stalin and Mao are said to have been on the Left. By this, I am led to believe that their ideas are socialistic, embracing the common ownership by the people of all means of production, distribution and exchange. But Russia and China appear to me to be sovereign states that are each under the control of a single autocrat who governs through a hierarchy of minions. Thus these countries behave like gigantic versions of a capitalist corporation. What is purportedly commonly owned is under the control of each respective autocrat. And control is possession. So that would place them well to the Right. As a person of the centre-Right, I imagine that my friend would prefer a society where people are socially graded according to economic, educational and cultural class but perhaps not according to race or ethnicity. I, on the other hand, would prefer a society in which people are not socially classified. That puts me at the extreme Left. Notwithstanding, I think everybody should possess, by right of birth, sufficient capital for him to be able to turn his labour into his needs and luxuries of life, independently of any employer or benefactor. That puts me well to the Right. So I must be a political paradox. I think this confusion arises because people try to over-simplify the notion of political stance. Years ago, when I was involved with filing systems, it was well known that if the number of available files was even one less than the number of categories under which documents had to be filed, then confusion would reign. Similarly, if one tries to express a composite concept like political stance with less than the number of independent variables it contains, then confusion will reign. Right-Left is a vari­able which can only move in one dimension. Yet people vainly try to use it alone to describe political stance, which is a multi-dimensional concept. So confusion reigns. The notion of political stance, which life-long observation has given me, comprises three separately demarcatable concepts, which are free to vary independently of each other. These are social character, capital distribution and mode of govern­ment. There may, of course, be others. But at least my three should yield a clearer notion of political stance than just one. I will therefore describe what I mean by each of these three and then assemble them to form a composite 3-dimensional view of my notion of political stance. To begin this quest, I need a clear overall view of the Earth. Satellite photographs show me a blue planet with white clouds and areas of oceans, mountains, deserts, and verdant plains with rivers. But do I see any firm evidence of intelligent life? Yes. Focusing on the British Isles, I see that although 34·9% of it looks wild, a dominant 57·6% app­ears to be divided into fairly regular shapes of varying colours. 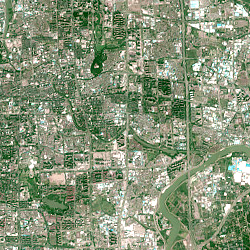 These are agricultural fields in which crops for human consumption are grow­ing. Spaced sparsely within some of these fields are much smaller dark regular shapes. These are buildings, some of which are houses for the people who are growing the crops, while others are barns for storing harvested crops and agri­cultural equipment. This seems to me to be a healthy and inspiring environment in which hu­man beings happily live and work with nature. 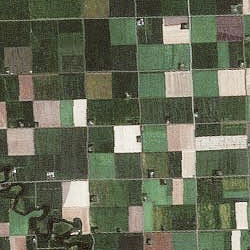 Dispersed within this landscape, I see numerous dark patches amounting to another 5·9% of the land area. The texture of these patches seems to have a fine geometric granularity. These are villages, towns and cities. These, for the most part, comprise houses, with a much lesser num­ber of larger geometric granulations which are factories, office blocks and shopping areas. So it would seem that most human beings live and work squashed together cheek by jowl in these comparatively small urban areas. This seems to me to be a very harsh environment in which to sentence people to live and work out their lives. So, although a smattering of people lives in the wild, the vast majority of humanity is segreg­ated into the two different kinds of artificially modified terrestrial environment I have just de­scribed. And while only a hundredth of human­ity is spread over the rural portion, the remain­ing 99% is packed into an urban portion only a tenth its size. 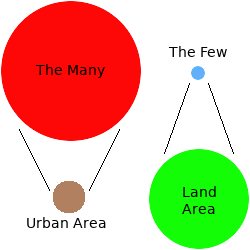 The illustration on the right shows the to-scale disparity in the amount of land occ­upied by each of the two groups respectively. I cannot help but wonder why humans opt to dis­tribute themselves in this way. What motivates the majority to incarcerate itself in a seemingly endless agglomeration of little brick boxes? If I were an alien space traveller observing the Earth for the first time, I think I would find this very difficult to understand. Why don't humans distribute themselves more homogeneously throughout the available land? Each nuclear family would then have the advantages of a healthier environment, a much higher level of self-sufficiency and the inspiration of nature, while still being sufficiently close together to permit ad­equate social interaction. I think that the only reasonable conclusion I could possibly draw would be that there must be some kind of ulterior force keeping the vast majority locked up in its urban prison. Is this current "view from beyond" a static situation or is the degree to which human society is polarised into these two distinct groups merely a snapshot within a dyna­mic process that is on-going? Looking back through the course of history, it is clear that human society has been in the pro­cess of separating out into these two groups for a very long time. Moreover, this has been tak­ing place at an ever-accelerating rate to arr­ive at the extreme situation we see today. So, what is driving this process? Human beings have no inner motive to drive themselves into an ever­more confined and ever less salubrious space. So what is concentrating them into their urban prison? Is it an attractive force like gravity pull­ing them into the cities or is it a repulsive force pushing them out of the countryside? In the idyllic past, the home of a nuclear family would naturally incorporate neces­sary and sufficient resources to allow its members to convert their own labour dir­ectly into their needs and luxuries of life. Those resources were what was above, on, beneath or grew on the hinterland of their home. 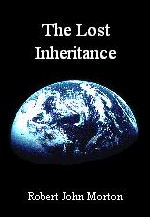 Although trade with others was possible and perhaps even desirable, it was not essential to survival. The idyllic nuclear family was essentially self-sufficient. The family lived in a healthy and inspir­ational natural environment and the mean free space between the family and its neighbours provided an ideal mix of socialisation and solitude. The modern urban home, on the other hand, does not have a hinterland. It is built on a tiny plot not very much larger than the house itself. Its occupants are not all­owed the free use of sufficient terrestrial resources to convert their labour into their needs of life. The urban family is thus wholly dependent for its survival on some ex­ternal means — over which it has no authority or control — of converting the labour of at least one of its mem­bers into the needs of life for all of them. So what, over the span of history, could possibly have motivated the generic family to leave its idyllic home for the depres­sing confinement of a small brick box in a tiny urban garden with no direct means of sustaining itself? The shops? The dance halls? The cinemas? The traffic? The irritable frustrated obnoxious neighbours? I think not. The driving force of this process of social polarisation cannot therefore be one of attraction, which pulls people into the cities. Consequently, it cannot be other than a force of repulsion, which displaces them from the countryside. So what is this ulter­ior force? It is the force of arms. How is it applied? That depends on the epoch. A Roman legion invades a tribal land to forcibly capture its people to serve a Roman master. A duke's claymore-brandishing private army clears the peasants from their lord's newly-declared hunting ground. The king's men clear the strip croppers from common land ready for "inclosure". A squad of Tommies with bayonet-fitted Lee-Enfields expel newly press-ganged WOGs from their smallholdings. The occidentally-armed wild-eyed demons of an African warlord expel herdsmen from their pastures to grow cash-crops for first-world supermarkets. Six Kalashnikov-toting thugs, hired by a corporate agribusiness, leap out of a Toyota pickup to run a defenceless chaca­reiro off his legally-held sítio. Espingardeiros, hired by mining corporations, expel aborigines from their legitimate forest reserves. The list is endless. And where is the only place these hapless displacees can go to survive? The ever-swelling cities. The human life-form is not inherently self-sufficient. It is a mere sub-system of the Earth's biosphere. It cannot therefore function without exchanging energy and mat­erials with its terrestrial environment. Consequently, to complete the functional sys­tem, of which the human life-form is a part, requires land plus what is above it, on it, beneath it and grows upon it. If all the habitable land on the planet were shared out equally among its seven billion human inhabitants, each adult, child and baby would have about two hectares (about 5 acres). Less than 36% of this is actually be­ing used to provide more than adequate sustenance for everybody on Earth. The ulterior force has thus severed the connection between the generic human life-form and the biospherical system of which it is an integral part. It has forcibly den­ied every person his self-evident inalienable right to acquire his needs of life from the terrestrial biosphere. In other words, it has perpetrated the greatest heist in history. It has dispossessed the people of their land through a heinous act of aggra­vated theft. The modern controllers of this ulterior force — the descendants of the perpetrators of this crime — are the dynastic families who now inherit all the econ­omic resources of Planet Earth. They watch their "wealth cascading down the gen­erations", giving them invincible power to safeguard their prosperity by excluding the dispossessed outsiders from direct participation in their chosen endeavours. If these dynastic families were to harness their own labour, they would have need of nothing and nobody. They could survive comfortably. But for such, comfortable sur­vival is not enough. They want more. Much more. They want luxury without limit. To achieve this, they must deploy a significant proportion of their terrestrial resources: their land and what is above it, on it, beneath it and grows upon it. The land itself provides space for fields, mines, factories and retail centres. The fields grow food, the mines provide materials and the factories turn the materials into the needs and luxuries of life, which are sold to the hapless consumer via their retail centres. The amount of labour required to deploy this significant proportion of their resources is much more than they themselves can supply. So the human labour needed to power all this must be drawn from the vast number of nuclear families tidily tucked away in their little brick boxes on the urban housing estates. The vast majority of ordinary families, who were historically displaced from their lands, are now compressed together in their bland urban housing estates, each in its little brick box. The "postage stamp" plot on which the urban house is built does not contain anything approaching the minimum necessary and sufficient amount of terrestrial resources to enable the family to turn its labour into its needs of life. Consequently, in order to survive, the urban family must attempt to exchange the only resource it has — human labour — for its needs of life. The dynastic family in its landed estate, on the other hand, only need deploy as much or as little of its vast terrestrial resources to achieve the level of luxury and well-being it desires from time to time. So it is unlikely ever to need all the labour that is potentially available from the landless urbanites. Thus, the potential urban workforce is most unlikely ever to be fully employed. Thus, although there is a strong interdependency between the Landless Many and the Landed Few, it is a very lop-sided one. It is a case of the Landed Few saying to the Landless Many: "You need us but we don't need you". Consequently, labour is always and inevitably a buyer's market, in which the buyer names the price. The desperate labourer must therefore accept whatever he is offered in return for his work. Those who possess the resources must, of course, provide those who labour with at least their minimum necessary and sufficient needs of life. Otherwise they will not be able to continue working. They would weaken and eventually die of starvation. Notwith­standing, such a situation would long before ignite a universal insurrection and pre­cipitate the wholesale theft and invasion of terrestrial resources. To avoid this, those who possess the resources are forced to maintain the amount of reward for labour at or above this threshold of universal insurrection. Hence the modern concept of the minimum wage, which is kept a little above this threshold. The relationship between the Landed Few and the Landless Many is one of master-and-slave in which the slave is free to change his master as the master is free to dismiss his slave; and the slave is paid for his labour in money instead of real food and accommodation. So I ask myself, could what is meant by Right and Left be related to the degree of asymmetry of interdependence that exists between the Landed Few and the Landless Many? The first asymmetry is in the division of terrestrial resources that can directly con­vert human labour into the needs of human life. I can perceive of an ancient idyllic society in which every nuclear family has allodial possession and use of its own fair share of the habitable land of the planet to turn its own labour into its own needs of life. This I would place on the extreme Left. The present day situation, where pos­session of all the resources of the planet is divided among a few oligarchs, I would place at the extreme Right. In the middle, the two groups — the landed and the landless — would be about the same size. There is here, however, a second asymmetry. The proportion in which the allodial possession of land is divided is not what directly determined the degree of well-being enjoyed by the generic individual in each of the two groups. It is directly determined by how good or bad a master is to his slave: how generous an indust­rialist is to his workforce or how tight-fisted a farmer is to his labourers. He who owns the resources names the price of labour. So whether the Landless Many live in misery or affluence depends on the endemic character of the Landed Few. And that is a cultural thing. So a completely different Right and Left could be a spectrum of measurement that spans the endemic character of the Landed Few on a scale from generous father-figure to miserly skinflint. An interesting observation here is that, in many aboriginal languages, the word — and hence the concept — for "slave" is the same as that for "son". So if a resource-possessing aboriginal tribesman were miserly towards his slave, he would be equally so towards his son. And if he were loving and generous to his son, he would be the same to his slave. Thus far we have two mutually independent social variables, either of which could be construed as a kind of political Left-Right scale. But there is a third one. The gross imbalance of wealth, which exists between the Landed Few and the Land­less Many, generates a reactive social pressure that pushes to restore equilibrium. Yet this imbalance is not only sustained: it is increasing at an accelerating rate. Con­sequently, there must exist an even greater causal pressure that is maintaining the disparity. What is this causal pressure? What is it that is preventing the urban house­holder from going out into the countryside and commandeering his fair and rightful share of the land resources, of the planet on which he was born, and using them to convert his labour into his needs of life. This irresistible causal pressure is the omni­potent force of law, the purpose of which is to facilitate and enforce the contain­ment and exploitation of the poor by the rich; the dispossessed by the landed, the meek by the exigent, the many by the few. Containment of the dispossessed is effected by government. It does this by formu­lating laws. These comprise statements which specify restrictions and prohibitions as to how the dispossessed may act and behave. These same restrictions and pro­hibitions theoretically apply equally to the Landed Few. However, the Landed Few are not generally perturbed by these restrictions and prohibitions simply because of the Landed Few's very different socio-economic situation. Infractions of these rest­rictions and prohibitions are detected by the police. The appropriate penalty is then determ­ined by the judicial courts in accordance with the law. The penalty is then en­forced by the police. Of course there are many sub-organs of State involved in var­ious ways for various situations. Nonetheless, the above is essentially how the sys­tem of containment functions. Exploitation of the dispossessed is effected by business. Perhaps the easiest exam­ple of a business to understand is the farm or "agribusiness". Human labour is appl­ied to the most fundamental terrestrial resource, namely land, in order to produce food. Human labour does not actually produce the food. The land does that. All hu­man labour does is to facilitate the growing of the food by planting seed, protecting the crop while it grows and then harvesting the fruit. This demonstrates clearly that human labour, of and by itself, can produce nothing. It can only aid and organise the biological mechanisms of the seed, air and land to grow. The same principle ap­plies to harvesting wood from the forest to make furniture or cutting stone from the mountains to build houses or to mining metals, coal, oil and other minerals to make and power machines and other products. Conversely, terrestrial resources cannot produce the needs and luxuries of human life without human labour to power the process. So the businesses of the Landed Few cannot produce anything without the labour of the Landless Many. A business needs a workforce. However, a business is not a complex dynamical system. It does not operate like a free egalitarian society. It is a structured system like a machine. As such, it has divisions that perform the distinctly different functions involved in the overall process of the business in converting terrestrial resources into the needs of life. These different functions demand different human skills, which must be applied to the production process in an organised and coordinated way. A workforce must therefore be structured and managed. This is the only business model under which the Landed Few can guarantee the permanent subservience of the Landless Many. The control structure of a business has the form of a hierarchy. Workers are under the command of a fore­man or gaffer. Foremen and gaffers are under the command of a manager. A group of managers exped­ites the orders of a director. Directors implement the policies of the chairman or company president, who is the autocratic head of the hierarchy. Although super­iors may ask for specialist advice from their inferiors, command propagates from the top down­wards. Infer­iors are hired or appointed by their superiors. So a business is not a democracy. Workers do not vote for their superiors. It is an autocratic hierarchy in which authority is maintained by the threat of dismissal for insubordination or inadequate performance. And a significant proportion of the Landless Many are unemployed, languishing in their little urban boxes ready to step into the shoes of whoever may get fired. The unemployed are driven to acquire employment not only by their lack of adequate needs of life but also by the force of law, which constantly bullies them by threatening destitution if they are not per­ceived to be trying hard enough to find work. Thus, the Landless Many live under a very Draconian regime of containment and exploitation. Please note: if each unemployed had not been forcibly dispossessed of his fair share of the planet on which he was born, he would have no need of Welfare [Social Security Benefit]. Welfare is, in effect, paid by the Landed Few to the unemployed portion of the Landless Many as a selfish act to avoid wholesale social insurrection. It is merely a pittance, returned in leu of each unemployed's self-evidently rightful share of the economic resources of his planet, of which he has been forcibly dis­possessed by the Landed Few and their forebears. But not so for the Landed Few, the significant among which — the proprietors of the great estates — probably amount to no more than the population of a natural anth­ropological community of 100 to 150 people. This Elite forms what I would call an uneasy egalitarian alliance. I would not call them friends. I do not think they have any real concern for each other. They are linked merely by an overwhelming mutual self-interest, which is how to continue and strengthen their containment and exploit­ation of the Landless Many. They could, of course, do this by brute physical force. They could bankroll private armies as did their forebears in the past. But this would be difficult today. Nations are too big and their people are too well educated and informed. The Elite has now learned well that delusion of the public mind is a much stronger container than force of arms. So the Elite lays its plans. It all starts with the "annual bash" in which each member invites all the rest to a great banquet at his stately home. There all engage in casual-but-key conversations. In pairs, in threes, in fours, fives, sixes and sevens. In the corners of the dining rooms and lounges. In the corridors and garden niches. There they whisper about real and potential problems. There they formulate the rudiments of solution. Afterwards, they put their ideas to their think-tanks of hired university men, who crystallise and formalise their ideas into social and economic policies. They select their political facemen: some from among themselves, pulling in others from the Old School and greybrick universities. They bankroll these selectees in political campaigns which are spin-tuned to delude a media-preconditioned electorate that what is good for the Landed Few is also good for the Landless Many. This idea that what is good for the Landed Few is also good for the Land­less Many is based on what is called Trickle-down Theory. Notwith­standing, under the precepts of neo-liberal free-market capitalism the wealth of the rich has no systemic reason to trickle down into the hands of the poor. The Landless Many think they live in a democracy. They think they have some kind of control over their collective destiny. But this is sham democracy. The electorate — at least for the most part — is politically passive. Each imbibes his pre-honed political opinion, from the impeccably orchestrated media, which he concretises in the idle chatter of a Friday-night beer haze. Hereby, the majority of the Landless Many exudes the firm conviction that its drip-fed political stance is the right one. Peer pressure — the desire not to be ostracised — corrals most of the rest into obedient conformity. The remnant of free-thinkers is overwhelmingly out-voted. The politics of the Landed Few thus prevails. The laws, by which they want society to be governed, become enacted and enforced upon the hapless dispossessed. This is why the urban householder cannot go out and commandeer his rightful share of the planet on which he was born to turn his labour into his needs of life. If an urban householder were to take and occupy what is his self-evident inalienable right, when the law formulated at the behest of the Landed Few deems it to belong to one of their number, then the act is called theft and is blocked by however much physical force may be required and the urban householder is punished as the law determines. This is a law of prohibition, which denies the Landless a self-evident in­alienable right. The law also imposes obligations. The most significant of these are the obligations to work and fight. The Landless are required by law to be in employ­ment or actively seeking it. If they are not, they are penalised. If the national terri­tory is threatened by a foreign power, the Landless are required by law to fight — and die if necessary — to defend it. If they refuse, they are penalised. The nation's territory essentially belongs to the Landed. Consequently, the law forces the Land­less to fight to defend the possessions of the Landed: not their own. Thus, as well as being, without choice, a member of a workforce exploited under the autocratic hierarchy of a business, the Landless Many are also, without choice, contained under the autocratic hierarchy of a system of law, which is specifically formulated to serve the interests of the Landed Few. All the democratic rhetoric notwithstanding, it is government of the Landless by the Landed to preserve the wealth and further the ambitions of the Landed. But there is an alternative. It is not difficult to conceive of an egalitarian society that does not rely on a vast underclass of slaves to power it. Of course, with advancing technology, the vast underclass could be replaced with robots. But this would be merely changing the slaves. The principle of hierarchical dominance and subserv­ience would be exactly the same. And what would the new Landed Few do with the old Landless Many they no longer needed once the robots took over the role of the workers? Mass extermination? The only humane alternative is to change the way everybody relates one with another. In place of a hierarchical relationship imposed by law and force, I propose an egalitarian relationship governed by a universal inter-personal Protocol. This way, the binary relationship between any pair of individuals within society takes the form of a link within a universal network. So do we have here yet another — a third — political concept of Right and Left? The present hierarchical society of containment and exploitation would be on the Right. My proposed egalitarian network society of Protocol-governed inter-personal rela­tionships would be on the Left. This third Right-Left dimension is illustrated below. At the extreme Right, society is a pure hierarchy. Links run from the top downwards and no effective relationships exist between individuals of the same layer. As you move from Right to Left, links start to form between the individuals of each respect­ive layer. Thus a hierarchy of embryonic networks begins to form. The strength of these links gradually increases the further to the Left you move. At the same time, the downward control links between members of adjacent layers of the hierarchy gradually weaken. The weaker these become, the more the embryonic networks of the different layers move vertically towards each other until, at the extreme Left, they all finally merge into a single flat egalitarian network. Examples of relationships that can form within a single layer are those between members of trades unions, professional institutes, secret societies and political parties. Of course, at the extreme Left, an egalitarian society contains no confrontational in­terests like trades unions, professional institutes, secret societies or political part­ies. It has no need of them. So there is no social motive for them to form. The only kind of groupings that would exist in a network society are benign interest groups such as sports clubs and knitting circles. At the egalitarian extreme, all control is devolv­ed to the individual. At this extreme, every person is his own policeman and society is governed by a universal Protocol, which specifies the principles by which an indiv­idual must bind himself to interact with his fellows. Peer judgement is still required in the event that an individual fails to follow or violates the principles of the Protocol. I would estimate that society today [Feb 2019], on the Right-Left scale of hierarch­ical versus egalitarian, is at about where indicated by the vertical black arrow in the above illustration. Heretofor, I have referred to the wealthy as the Landed Few and the poor as the Landless Many. People today do not always equate wealth with land. They equate it with money or capital. Notwithstanding, both capital and the needs of human life can only be generated and sustained by land. For a detailed exposition, please see Land, Wealth and Capital. So we have three different variables that can be thought of as varying along a line (or axis) between the political Left and the political Right. These three variables, which can vary independently of each other, are as follows. The first independent social variable represents the proportion of people that owns land. Land, as a terrestrial resource, signifies the space it provides, what grows upon it, what is hewn from it, what is mined or pumped from beneath it and the sus­taining atmosphere above it. As such, land is the only means whereby human labour can be converted into the needs of human life. On the political Right, pretty well all land is concentrated into the hands of a Privileged Few. The vast majority of the people own — have allodial possession of — none of it. On the political Left, the land, as an allodial possession, is distributed equ­ally to each of the people, whether or not he actually occupies it. Although I dealt with the variation in the distribution of land ownership first, I have shown it as the Z-axis in my vector-space diagram for better conceptualisation. The second independent social variable can be thought of as a measure of the character of society, particularly the nature of the master-slave relationship between landed employer and landless worker. It could equally well be thought of as a measure of the degree to which a master over-exploits his slaves. Even in a highly polarised society in which an extremely small few own all the re­sources and almost everybody owns none, the quality of life can be good for everybody if masters are generous and their slaves are honest. Conversely, it can be a hell of hardship if the masters are greedy and the slaves are thievish. On the political Left is the Biblical good master who is kind and generous to his slaves, who will, reciprocally, run the second mile for him to resolve a crisis. On the political Right, is the greedy self-seeking master who rewards his slaves with the minimum suffi­cient needs of life necessary for them to continue serv­ing him: the hall-mark of modern neo-liberal capitalism. Good masters don't stay in business very long. The variation between greed and generosity I have shown as the X-axis. The third independent social variable represents the mode by which society is governed. It ranges from fully centralised hierarchical control on the political Right to fully distributed autonomous control on the political Left. On the ex­treme Right, society is ruled by what is in effect an autocrat in accordance with policies formulated by himself. On the extreme Left, society is ruled according to a universal Protocol, by which every individual is bound to live, as policed by his own conscience. I have shown this variable on the vertical Y-axis because hierarchy is a vertical concept. 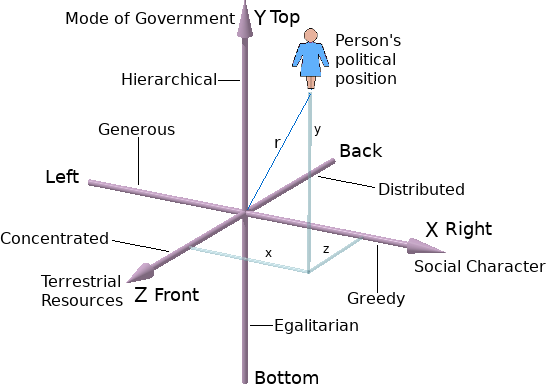 The political vector-space diagram resulting from the combination of these three independent variables is shown below. 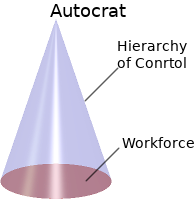 A person's political position or stance is therefore manifested as a point within this 3-dimensional political vector-space. The position of my "centre-Right" friend could thereby be represented by the position of the "blue lady" in the above diagram. Her position up the Y-axis shows her as being in favour of a hierarchical mode of gov­ernment but not so extreme as to destroy the public illusion of democracy. Her position along the Z-axis shows her as being in favour of a somewhat less obscene concentration of wealth than is currently the case. Her position along the X-axis shows her as firmly favouring the Thatcherite philosophy that economic greed is a benign force. I would not presume to suggest that this is my friend's real political position. It is merely a convenient way for me to illustrate the principle of the pol­itical vector-space I have described in this essay. My own political position is different. I am at the very bottom of the Y-axis, meaning that I favour a society in which moral education makes it possible for each to rule himself, in his relationships with others within a network society, according to a fully internalised universal Protocol policed by his own conscience. I am also at the very back of the Z-axis, meaning that I favour a society in which each has full allodial ownership of his fair and rightful share of the planet on which he was born. I am also at the extreme left on the X-axis, in that I believe that masters (if they exist) should be as generous to their slaves (if they exist) as they are to themselves. In other words, my positions in all 3 dimensions of my political vector-space signify that I believe that each should love his neighbour as himself. A tall order indeed and one for which the human spirit is not yet sufficiently evolved. So where, within my political vector-space will we find Thatcher and Reagan, Hitler and Mussolini, Stalin and Mao? Since they followed the neo-liberal creed of greed preached by Friedrich Hayek and his disciples, Thatcher and Reagan are obviously at the extreme Right on the X-axis. The Capitalist philosophy of unlimited self-gain also places them well forward along the Z-axis; probably a lot further forward than I indicated for my centre-Right friend. Their firm belief in the rule of law also places them reasonably high up on the Y-axis; perhaps again further up than my centre-Right friend. Although Social­ists, Hitler and Mussolini were nationalists. All Resources fell under the control of the nation, which by consequence, means its autocratic leader. This places them at the very front on the Z-axis. The autocrat effectively owns all national resources simply because he has absolute control over them all. They would also be at the very top of the Y-axis because the whole nation is gov­erned by a totalitarian hierarchy. On the X-axis, however, I would place them a little bit to the Left of centre because their socio-economic endeavours are Socialist. Notwithstanding, it is an exclusive socialism for the benefit only of the ethnic mem­bers of their respective nations. I would place Stalin and Mao ostensibly in the same positions as Hitler and Mussolini except that their Socialism is theoretically inclusive to all humanity. Of course the 3-dimensional view within my vector-space paints a very different pic­ture of these three regime-types than the over-simplistic indefinitive view of con­ventional Right-Left. Where would Labour — the so-called "Socialist Left" — appear within my 3-dimen­sional political vector-space? The Labour movement was born [as far as I under­stand it] out of the reasonable desire of the over-exploited Landless Many to acquire some measure of political power in order to better their lives and well-being. As such, the Labour movement and its associated political parties only have reason to exist so long as the Landless Many exists. In other words, only so long as society be polarised into "those who have and work not" and "those who work and have not". The Landless Many, as a group, can only exist while wealth is concentrated into the hands of the Landed Few. Consequently, the significance of Labour diminishes as one moves from front to back of the Z-axis. At the very far end (the back) of the Z-axis, the concept of Labour disappears because there everybody owns their fair share of the Earth and its resources. Labour also exists to combat the exploitive oppression of a ruling hierarchy. 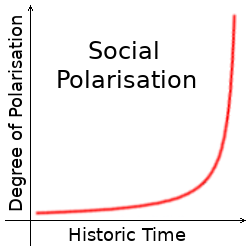 Therefore it is stronger the further up the Y-axis the current mode of government is located. In an all-inclusive egalitarian society (the bottom of the Y-axis) Labour would be irrelevant. Labour exists to fight the greed of the Landed Many (the large employers) and force them to distribute more of the produced wealth to the workers in terms of better wages. Labour is therefore only relevant when society is ruled by corporate greed (at the Right of the X-axis) and is correspondingly irrelevant at the Left of the X-axis. Consequently, the relevance of Socialism follows the prominence of Capitalism. The two are merely opposite sides of the same coin. If the coin ceases to exist, then both its sides obviously cease to exist. At any given time, both will inhabit essentially the same location in my political vector-space. They are opposite poles of a political charge-field whose potential difference (or degree of mutual antagonism) increases the further they move to the Right, the Top and the Front of the X, Y and Z axes respectively. At the Left, Bottom and Back of these respective axes, the antagonistic potential between them is zero because social polarisation is then zero. Of the eight cubic divisions in my political vector-space, it would appear that one of them is not inhabited by any known political persuasion that exists in the world today. That cube is the one bounded by the Left, Back and Bottom respectively of the X, Y and Z axes. This cube would therefore appear to be a realm of political thinking that has never been implemented and with which no society ever seems to have experimented. Bearing in mind the dysfunctional mess the world is now in, perhaps it is time we explored this unknown political realm. It may be what we have always been looking for.